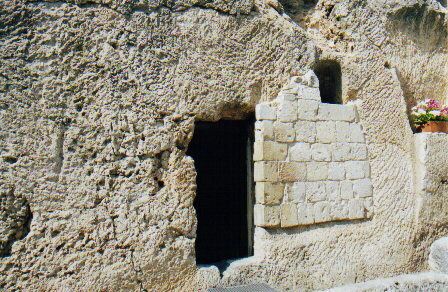 The Garden Tomb - This is one possible location of Christ's burial. The Gospel of John records that the body of Jesus was placed in a newly carved tomb originally made for the wealthy Joseph of Arimathaea. General Gordon discovered a tomb (known as the garden tomb) within a short distance below a rocky cliff. Gordon believed at the top of the cliff on the hill was where Christ was crucified. 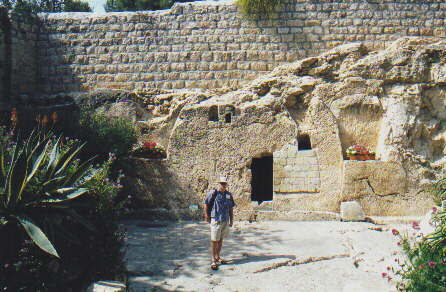 He postulated that the hill was "Golgotha" and Christ's body was taken to the tomb below the rocky cliff.